Options Management are able to recommend a full range of cold drink systems to meet most budgets, from bow-fronted, branded can and bottle vendors to the latest glass-fronted vendors that can deliver both cans and bottles. Most systems work with cash/coins or if you wish, we can fit our latest credit and debit card readers for any application. Browse our cold drink options today or call or email our team for further advice. 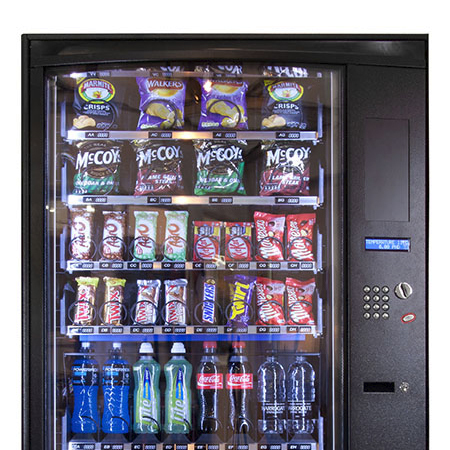 The vending machines from our company are highly attractive and can blend easily into any environment, from a small office to a public or factory location. Find out how you can give your staff high-quality drinks at the press of a button with options of free vend, coin operation, or credit/debit card payment systems. 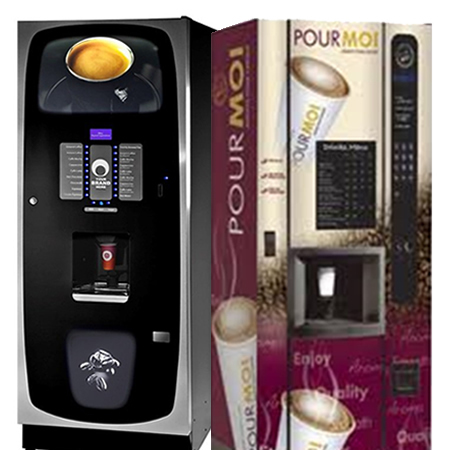 Take a look at our free standing hot drink machines, or call or email us for more details. The UK market for coffee and continental-style coffee shop outlets is large and expanding rapidly. At Options Management, you can have your package tailored to suit all applications. 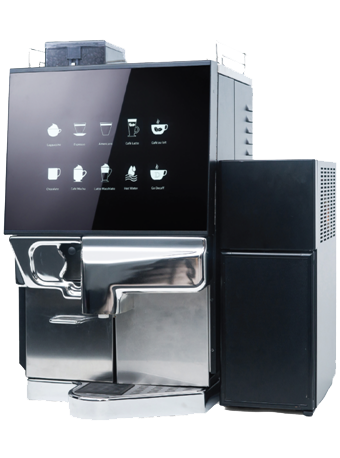 from simple press-button soluble or bean-to-cup machines to the traditional barista systems. Have a look at our table top machines or contact our company directly for more information. 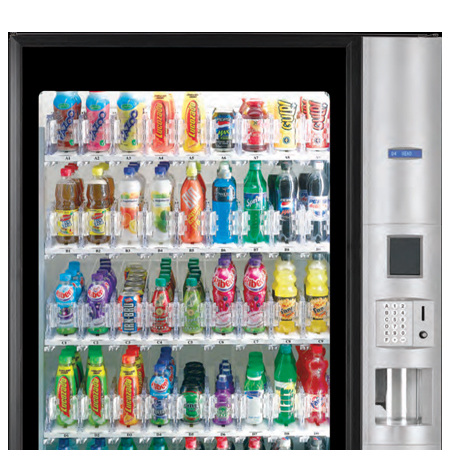 When you are looking for a small office or reception-style drinks machine, look no further than our company. From free vend to coin or cashless, we offer a full range of coffee systems for any location. You can use your own china or paper cups - the choice is yours. Browse our selection of table top machines or contact the Options Management team for further assistance. Options Management has a full range of snack and food vendors for any location. These machines are able to combine snacks, cans, bottles, and fresh food on request. We offer a dedicated fresh food vendor for out-of-hour locations along with snack and confectionary machines for your convenience. All machines can take coins and most card systems, including our snack and food options. Phone or email Options Management today to find out the type of machine that suits your establishment best. 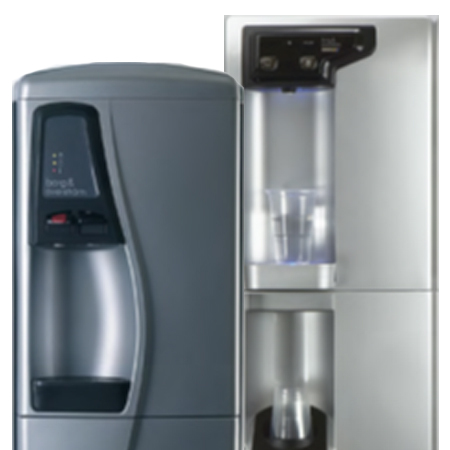 Our company specialises in a vast selection of water dispensers, from water-filtered, plumbed-in units straight from your mains to portable 19 litre chilled bottle units. These are ideal for your leisure centre, school, or workplace where your staff or visitors require a refreshing cold drink. With the choice of using your own bottles or alternatively using a plastic cup/cone to drink from, look to our full range of water coolers page or contact Options Management for more details. 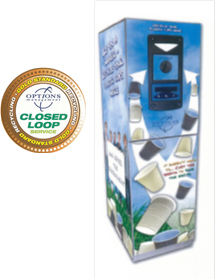 Recycling Options is the sister company of Options Management. The reverse vending machines and retail-based recycling systems are designed specifically to combat litter problems by recovering cans, plastic/paper cups, and glass/plastic bottles. While many large organisations and locations utilise our recycling services, we have solutions for smaller sites with an emphasis on cup recycling, as you can see when you watch our video. We are the only company in the UK that recycles our customers’ used containers. Contact us to learn more about our reverse vending machines and recycling services.